I've tried the much-written-about Omorovicza Queen of Hungary Mist (mini samples. Too sticky, didn't like the smell, and the spray nozzle didn't work in both nozzles, grr). I use the La Roche Posay Serozinc regularly but it's not the most exciting thing out there. The Liz Earle Instant Boost Skin Tonic Spritzer smelt a little too powdery for me and didn't really feel particularly moisturising. Avene Eau Thermale is something I normally reserve for my body when I have skin irritation. I recently picked up the Suti Rose Water Organic Facial Spritz when I was actually looking for the Melvita Rose spritz. I've never used this brand before, but since I've read good things about them on various blogs, decided to give this one a try. 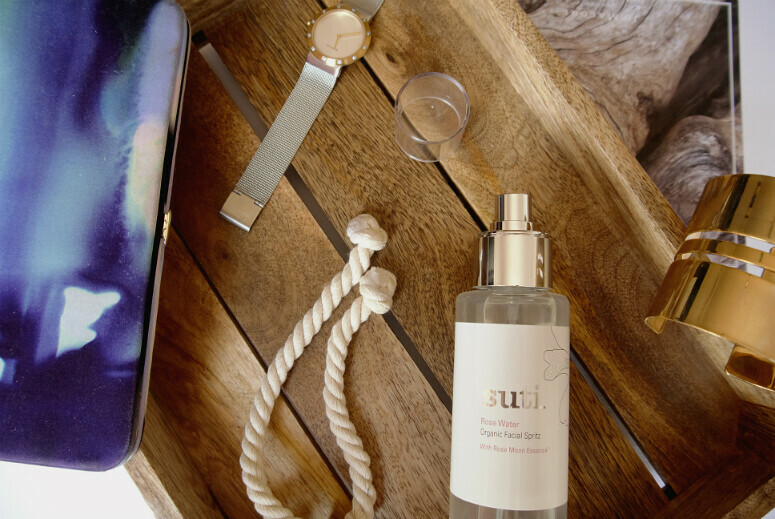 Featuring the brand's own Rose Moon Essence, Suti's holistic approach aims to soothe the skin as well as relax the mind. With 'renewal and regeneration' the focus of this spritz, it smells lovely if you like rose scents, as I do. I don't know if I buy the whole spiritual healing thing, but I do find the rose smell quite calming. I don't think I would buy this again once this finishes, because I'm a spritzer floozy, but I'll enjoy it while it lasts. If you like rose scents, you may want to take a look at this and test it because you might love this more than I do. Suti Rosewater Facial Spritz is £22 and can be bought from Whole Foods and Suti's own website. This photo is so clear and crisp. I am on the hunt for a spray/mist for my face so will defo look in to this.